THIS EVENT HAS BEEN CANCELLED AS SEVERE WEATHER IN DENVER HAS PREVENTED THE AXIS TEAM FROM TRAVELING. Last year, a team from Axis Ministries came to our school. The students were challenged to think about how they interacted with the world and to each other, especially through technology. Axis Ministries offers a FREE resource called The Culture Translator. If you would like to sign-up, simply click here. From their website: "The Culture Translator provides weekly insight into how pop culture, technology, and media are influencing your students while equipping you to start biblically based conversations." Setting: Where is the story taking place? Character: Who am I and what role do I play? Plot: What is the purpose of my story? Conflict: What acts as a roadblock in my story? Climax: Will I overcome the conflict and achieve my purpose? Resolution: How does the story end? This presentation connects the generations by learning about GenZ's culture, how technology impacts them, and gives practical tips for talking with and discipling students toward lifelong faith. Click here for a video to learn more. Dr. Cliff Hull spoke to 9th to 12th grade Rockbridge students during a Young Engineers and Scientists (YES) talk about different careers in the STEM field and how to decide from a biblical standpoint what to do in life. “It was really cool how he tied everything to Christ,” said freshman Tomi Akinyelu. She said that Dr. Hull talked about trusting God to guide Christians in what to do in life. Dr. Hull has done a YES talk before and was in fact the first YES speaker Rockbridge ever had. The first talk he gave focused on chemistry, since he is an analytical chemist who does research on fuel cells. Dr. Hull said that he decided to discuss not just STEM, but how to decide a career in general because he wanted to do something with a broader focus and something that would encompass the entire scope of engineering and science. Dr. Hull also incorporated a biblical worldview into this topic by explaining how a Christian’s calling helps guide them in their careers. During his YES talk, Dr. Hull explained what STEM is. He also said that in order to discover one’s Christian calling, one needs to belong to God, follow Him faithfully, discern one’s abilities, and then fulfill that calling. Then, he listed different degrees and fields within the STEM area to help the students see if their calling is somewhere in the STEM field. At the end of the talk he challenged Christians to make inventions or discoveries in the STEM field. For example, he discussed how a student with a biochemical degree might seek to create an artificial womb. At the end of the YES talk, Dr. Hull gave out The Call by Os Guiness and What Color is Your Parachute (Teen Edition) by Richard Bolles, two books that talked about different callings and careers. “I wanted to do something tangible for the students and bless them,” he said. The students enjoyed the book prizes. “He was really kind in giving out those books,” said sophomore Kait Atwood. Senior Kathleen Wallace, the coordinator of the YES talks, said that Dr. Hull was in Mr. Keehner’s office one day saying that he wanted to come back and talk to the students, so she coordinated a time with him to come and speak. Wallace really liked Dr. Hull’s focus for the talk. She explained that she enjoyed that he urged the students to do what they love, while also serving God. The student’s thoroughly enjoyed Dr. Hull’s YES talk. “He had a lot of really fun puns,” said freshman Lily Bailey. Dr. Hull also enjoyed talking to the students. “I enjoyed it when the students came up to me afterwards and thanked me,” he said. “I thought it was encouraging. The February 7, 2018, competition was the first one for the students on the defense team, and the fourth competition for the team as a whole. Rockbridge remains undefeated as they go into the fifth week of competition. Last year, the team was undefeated in Anne Arundel County and went on to the Circuit Championships. Congratulations to the Mock Trial team! Go Scots! Join them this Wednesday as they take on Annapolis Area Christian School at the Circuit Court for Anne Arundel County (8 Church Circle, Annapolis, MD 21041). 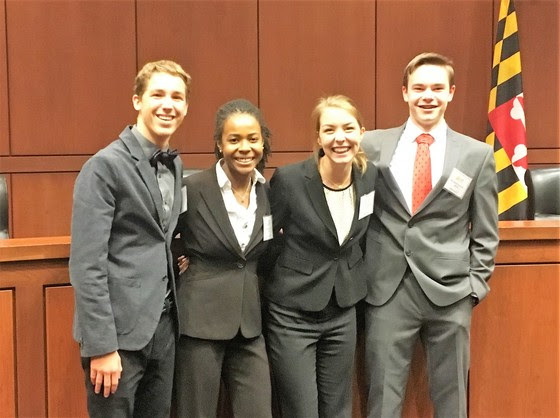 Congratulations to our students who competed in the Maryland State Moot Court Competition! On Saturday, November 10, 2018, Rockbridge Academy juniors, Charity Arrington and Lauren Bailey, competed in the Maryland State Moot Court Competition. The competition involved student attorneys arguing a case on appeal to a mock Supreme Court. This year's competition involved issues concerning the legal interpretation of the First and Fourth Amendments. Student attorneys are required to prepare an argument for presentation, but the greater challenge comes from answering questions from the panel of judges. Students are asked questions presenting hypothetical extensions of their arguments, as well as questions about the relevant case law. The Rockbridge team, competing for their first time, performed stupendously, making it through four preliminary rounds to the state finals. They lost by a narrow three-point margin, ultimately placing second in the state. Congratulations to these outstanding students! Also, a shout out to our alternates, Ben Ault and Owen Schulze, who also prepared for the entire two months with the team! 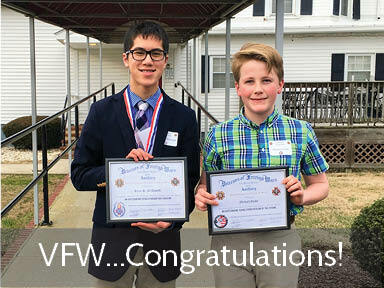 Congratulations to Ryan McDowell, Rockbridge Academy junior, and Michael Grube, Rockbridge Academy 7th grade student, on their participation in the VFW (Veterans of Foreign Wars) Voice of Democracy speech contest and Patriot's Pen essay contest. Ryan won 1st place in the state of Maryland and will advance to the national competition in March. Michael won 6th place in the state of Maryland. Both received monetary awards.